Apple’s upcoming streaming service aptly named Apple Music has been in news over the past few days, that too for all the wrong reasons. The service got into the negative spotlight when it was revealed that the company won’t be paying anything to artists whose songs will be played on Apple Music during the first three months, as it is offering a free trial to the users. This angered many artists who protested against the company’s decision. Taylor Swift took it to the next level by pulling her popular album ‘1989’ from Apple’s service. As it turns out Apple did listen to the singer’s demands and has now announced that it will pay artists during the free trial period of Apple Music. All of this drama has been nicely captured by Joy of Tech in a comic shared below. 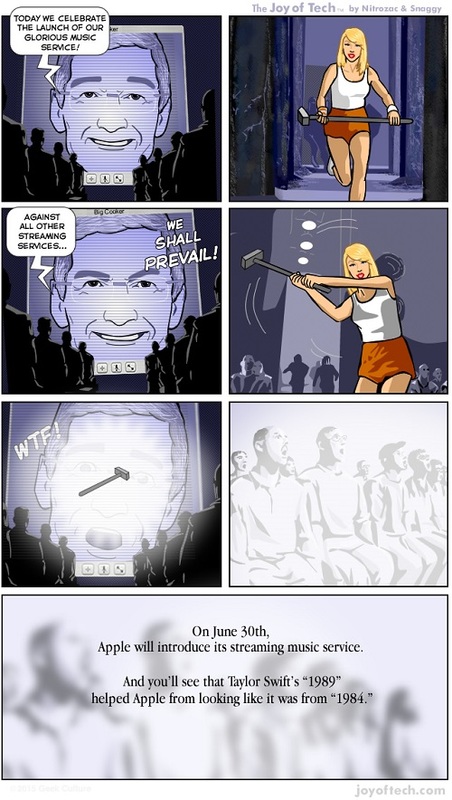 The comic brilliantly compares Apple with the image of big brother, featured in company’s own 1984 Ridley Scott commercial.